When you’re just starting out in a kitchen, sometimes reading through a recipe’s ingredient list can be even more intimidating than the actual recipe. I cannot count the number of meals I have not cooked over the years because I was avoiding an expensive and heavy trip to the grocery store. This is partly because of the number of meals I have also cooked over the years that required seemingly limitless numbers of ingredients, which sat barely used on the kitchen-y part of my bookshelf for months afterwards. Oh, raspberry vinegar. You made my Wheatberry Salad taste so delicious, but what have you done for me lately? Nothing, except keep the Garlic Pepper and Tartar Powder company in this elephant graveyard of leftover ingredients I seem to have created. Pad Thai has only two ingredients, I tell myself: my phone and my wallet. But the wallet part is a stumbling block, and a lady cannot live on Pad Thai alone–something my doctor has been telling me for years. That’s why it’s important to have some recipes on hand that don’t require a lot of accessories, so to speak. Sure, you’ll probably want to buy some items like meat or dairy close to cooking time, but other items you’ll have on hand, and the point is you don’t need a lot of them. 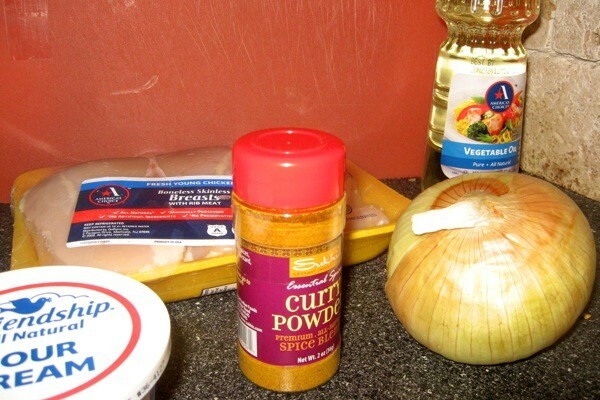 In the spirit of keeping you from talking yourself out of cooking your next meal, I present to you Five Ingredient Chicken Curry, a meal so easy, delicious, and fast that I you should know about it yesterday. Best of all, I am not lying–it really has five, count ‘em, five ingredients. For those of you keeping score at home, salt and pepper don’t count because they are items you could steal from a dining hall. Well, I suppose depending on your campus, you could steal a lot of things from your dining hall, and I’ve been told that stealing is actually frowned upon in many cultures, so I shouldn’t encourage it… Instead, let’s say salt and pepper don’t count because they are items you could legally take for free at the condiment station of a fast food restaurant. Speaking of which, stay tuned next week for my Zero Ingredient Feast, constructed entirely from ketchup packets, pickles, and those napkins the people before you left on the table! In a large skillet, heat the oil over medium-high heat. Sprinkle with salt and pepper before adding all the onion. Cook onion, stirring occasionally until it becomes soft and translucent, or about 5 minutes. Reduce heat to medium and add half the curry powder. Continue to cook for two minutes. Once cooked, transfer chicken to a separate plate. Reduce temperature to medium-low and add sour cream, stirring until onion mixture is nice and thick. Add chicken and cook for two more minutes. Serve the curry on its own, or with rice, bread, a tortilla, or any other carb of your choice! Categories: Campus Cooking, Kitchen Course Catalog, and Recipes. I Don't Have Any: Cooking Skill, Money, and Pantry Items. I'm Cooking For...: Dinner Party, Easy Dinner, Myself, Picnic, and Spring Break. Type of Food: Meat and Poultry.